Why do I need ember guards? According to the NSW Rural Fire Service (RFS), most houses burn in bushfires when ember on your gutters ignite a fire. Make sure to install a reliable leaf guard that will not ignite fire during intense heat or bushfire. 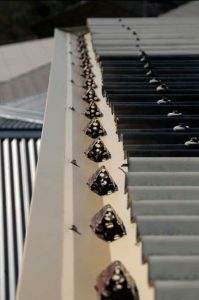 The leaf-litter that collects in conventional gutter guards provides unwanted fuel build-up for a fire to ignite from flying embers – which can quickly spread to the eaves and roof cavity. This makes your gutters the most susceptible part of your home to ember attack. It is essential that you install a high quality ember guard to help protect you from bushfire danger. With our innovative lead gutter guards, you can be sure that leaf litter build-up is reduced due to its shallow-dish effect. In addition, any burning embers will not burn through the COLORBOND® Steel. The EASY FALL™ Leaf & Ember Guard has been independently tested by the CSIRO according to AS/NZS 1530.3:1999. Results were ZERO for ignitabilty, flame propagation and heat release. The NSW RFS recommend protecting your home with quality metal leaf guards. For guttering Sydney products, consult our gutter experts by calling 1800 897 444.